Yes, loved this! We are made in God’s image, the great creator. I feel at such times the spirit, words, colours, shapes flow from Him with a tangible closeness. Claire, I agree with you. It’s a beautiful and magical thing when His Holy Spirit leads in the creative process. It’s like a partnership. I love it. Thank you so much for you comment and for you kind words. 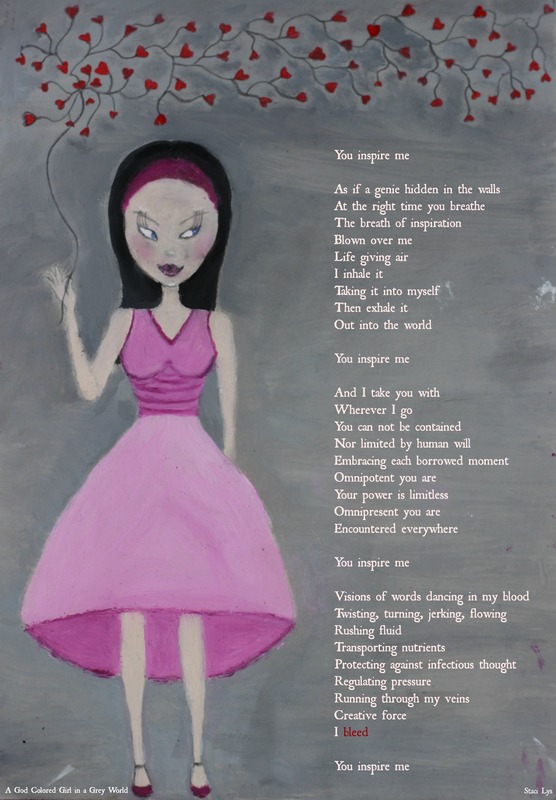 You inspire me also my dear sister, everything blends perfectly together with the poem and the image! You made me smile tonight! Thank you! Hugs! Hello Wendell. Thank you so much for your kind words. And I am so pleased that I was able to bring a smile to your face. What an encouragement. Trini, thank you so much. I’m so glad you enjoyed this. Oh yes, most definitely. Creativity definitely comes from the soul. Ultimately, what we create is an expression of our soul, right? –We have been made in His image and His likeness. From here I derive my thoughts on humanity: we were made to create and made for relationship. He is the master creator, and he has always lived in relationship. Such a lovely doll, the painting and the poetry are wonderful source of inspiration. You have mastered this art of painting and poetry. Yes, Staci we all have our own sources and it differs from person to person but there are some sources which are common and universal. Being in the midst of nature and basking in the glory of success, being in the company of lovely people and having a wonderful conversation with friends, the joy of reading a lovely book to enjoying a sumptuous spread of cuisines are all food for thoughts and foster our mind to think different and think creatively. Nobody exactly knows when it comes and where from it comes, yes it is a divine force and that comes and makes produce some brilliant thoughts into poetry, stories to plays to painting to singing…it takes different forms to express our creativity. I think we had a lovely discussion on these Greece and Rome, and there take on “Daemons” and the “Genius”. This is an interesting facets of how our perspectives have changed and how we have been looking at creativity, and it has a long history and it has evolved over time and has manifested in so many diverse forms. We all are creative people and creativity is natural and we all are bestowed with it but it all depends on us and how we nurture it and how we build on it and what means we adopt to take it further. These are our conscious decisions and constant efforts to keep the magic working otherwise we loose the steam and we are left with no source of inspiration to keep the creativity working…it becomes mundane and it is a monotony that is against the premise of building on creativity. Hope you are doing fine and have a lovely weekend. It’s been long that we had some good conversation and let’s catch us…take care!!! Heyyyyyy Nihar, yes we did have quite a conversation about Ancient Rome and Greece, didn’t we? I had sent you that Ted Talk by Elizabeth Gilbert to watch. I have watched that more than once. Haha. So good to see you. I’ve been thinking about you actually. I must get over to your blog and see what you’ve been up to. We have also had extensive conversations on the topic of creativity, haven’t we. I know that you are one that truly appreciates this gift. I completely agree with you that we are all creative people. We may ‘create’ in different areas and spheres, but we all create in one way or another, whether it be an art or a recipe. It really does depend on us too, doesn’t it? We must nurture and invest in our talent so that we grow. If not, it just lays lament. Yes, I am doing very well, thank you. How are you? Please have a wonderful and restful weekend, my friend. Well well Staci, yes I fully remember we had such lovely conversation on Rome to Greece, and I really enjoyed the Elizabeth Gilbert Ted Talk…I need to watch once again. Things have been hectic here and been looped in various business projects and not able get the sumptuous time for writing as earlier and just managing to squeeze in some time for blogging. I agree this is not a good thing and moving away from our passion and being away from creative zone is not something I like and I am sure you also don’t like. –Most definitely. If I don’t get my space, I can get moody. Hahaha. I also think this ‘creative’ nature is one of the things that sets us apart from the rest of the animal kingdom. I hope you had an amazing weekend, and that you did get some time to relax Nihar. Have a lovely week ahead, my friend. Thanks to you too. Always, always such great pleasure talking to you and sharing such lovely thoughts and for that thank you so much…take care!!! It is so fun to see how God has created all of us to create, and in such unique ways. I love to write, my son loves to create music, my daughter loves to create new baked goods, my husband loves to create puns, one friend loves to create order, another loves to create beauty in her home, the list goes on. I am so blessed that He has allowed me to enjoy your beautiful creations of art and poetry! Blessings! Heather, yes I agree with you. We were all made to create. Not all in the same area, but we definitely all create. Thank you so much for your lovely comment, and for the kind words. I am also blessed to know you and read your posts, my friend. Awwww, thank you so much Natalie. You are so kind with your words. I like the painting a lot – but I know how things do not always come out the way we want – and for me – my very favorites are pieces I have done for class samples and took less than an hour – for some reason, I like them most. anyhow – cool poem too – and how do you put that on an oil? Ohhhh, haha. I digitally put the poem in. I took a photo of the art and then uploaded it to my computer and digitally wrote the poem. oh thanksfor sharing and actually remember hearing rick warren say that the reason his “purpose driven life” book so long was because he made sure every entry was on a single page and that out was simple…. and I remember the keep it simple stupid quote – did you know that there are actually a series of books with the “KISS” acronym – they are supposed to be like the “Dummies” series of info books – and I had a couple KISS books and they were pretty decent. It was a while ago. anyhow, hope you are well too – things here are nice – a quiet start to June – with lots of sunshine on the first day – and do you know why this is so special? it is because last month – May 2016 -w as the most rain we have had in May in our town since the 1800’s – so that means there were a lot of rainy days – I was busy with misc. so it was fine… but the sun today was nice – I did yoga outdoors and oh my…..
Hi Yvette. I did not know that @there are actually a series of books with the “KISS” acronym. That’s great. I wonder if they have one for drawing. Hahaha. Actually, my mom gave me ‘The Complete Idiot’s Guide to Drawing.’ I’ve only gotten through the first three chapters. I need more time Yvette. Ugh. Well, we are getting colder here. Lots of rain this morning. It was heavy. Hope you’ve had a nice week, and that your weekend is wonderful. I believe we were made to create, too, Stacy. We have this talent in our DNA. But some people can’t discover (recognize) this little secret that they have. But you… You embraced your little secret. Awwww, and you have embraced your little secret too Monica. Checking in to say hello, Staci. As always, I love your art and poetry. Hoping to get back to some creative writing very soon. I miss taping into the creative part of me. Been busy with my new job and my friend. Sending love your way! Heyyyyy Geralyn, so great to see you. I was actually in your blog not too long ago to see if you had written anything recently. I hadn’t seen you in my Reader for so long. How is the new job going? And how is your friend? I hope all is well, and thank you so much for the visit and for your lovely words of encouragement. Hi Staci, Making a slow re-entry in blog community but haven’t posted anything new. My friend is better but still very much impaired. She’s got a very, very, very long road ahead and is still in rehab. I am well. Life is good, trying to stay grateful! Hope you and your family are all well. Enjoy your weekend!! Ohhh, so glad to hear that you are making a re-entry Geralyn. I’ve thought of you during your absence. It’ll be nice to see your posts again. I’m sorry to hear about your friend, but I’m glad that she has made some progress. She’s lucky to have friends like you that are there for her. I’m doing well thank you, and my family too. I had some bumps in the beginning of the year, but thankfully things have smoothed out. Haha. That’s life thought I guess, eh. I hope you had a wonderful weekend and that you have a lovely week ahead. Staci, how lovely your poem echoes a similar theme which was captured in the Ted Talks with Elizabeth Gilbert, especially the part where she talks about creativity being inspired by the divine. As always a wonderful poem and beautiful artwork. I love the use of the repeat, “You inspire me”. I also enjoyed reading your other post, “Impulse to create and establish order”, it’s a perfect companion piece to this post. For some the need or desire to create is like breathing, it just has to be done. For others I think the fear of judgment holds them back and lastly there maybe those that have no desire, which is difficult for me to believe. The reason I say this, is because we as human beings need to tell our story. Often we tell this story in the subdued and subtle fashion of artistic creation, in whatever medium is available. I also believe for a creation to be successful we have to be earnest, putting ourselves into the effort, otherwise the exercise of creation is futile and it might as well have come off an assembly line. These are just my thoughts and I’m sure anyone can rebuke them. Mia, thank you so much for your kind words. You know, when I was doing this on Thursday, I thought of our recent conversation. I thought this so in line with it. Haha. Thank you also for reading the other piece too. I had posted it quite a while ago. More than a year. Maybe even two years. Not sure. I think that one has to have a certain level of self-esteem too to create. If one doesn’t think they’ll do any good, they just won’t try, right. I used to be like that (somewhat). The visual art thing, like the painting and all, is very new to me. I just started to really enjoy certain mixed media and art pieces that I decided I wanted to give it a try. So funny. I had always been a performing artist. Used to dance and act. Still sing (just not as much). Writing poetry and the visual arts are very new to me. Haha. –Ohhhhh, I love this comment here Mia. I totally agree. I love the story of “The Little Drummer Boy.” You know the Christmas carol? I love it’s simple, humble message. That kid didn’t have much. All he had was a little drum. But when he saw Jesus laying there, and the wise people giving him expensive gifts, he knew he didn’t have anything like that to give. He offered to play the only thing he had, his drum. I love those lyrics in the last verse, “I played my drum for him. I played my best for him. Then he smiled at me.” I used to cry when thinking about that. I thought it was so beautiful. He wasn’t perfect, just as nobody is. But it wasn’t his perfection or amazing talent that made Jesus smile, but it was the gift offered with a humble heart. Giving his all into what he did. I decided to make that my mission in life. I know I’m no great artist or writer. But I love it, and I want to do the best with the tiny little bit I have. And I think that’s what really counts. I recognize this about you too. You don’t want to just throw any old thing out there into the world virtually. You put yourself into it. It’s all about authenticity, isn’t it Mia? Anyhow, love your thoughts Mia, and thanks again for your kind words and for sharing. Staci, you’re most welcome and thank you for a marvelous reply. Well the new you is quite exceptional, it’s nice to know that you have a background in the performing arts. It’s wonderful to be able to explore all avenues of creativity, I always thought they all went hand in hand. Like you, I believe that everyone has the potential to be creative, as you say it can take many forms. I like that you brought up the story of, “The Little Drummer Boy”. I think when you put your heart into anything you create, you should give it 100%, that’s if you’re sincere about your creation. It’s not necessarily about quantity but rather the quality and how it’s viewed by others. When I think of “viewed”, I always hope that the work will move the viewer somehow, challenge their senses, for good or bad, leaving them with something to thinking about. Yes, also like you, I’m very conscientious about what I post. I don’t post just for the sake of posting. I love the following “It’s all about authenticity, isn’t it Mia?” Absolutely! I would have it no other way. I enjoyed reading this piece again. I love your artistic representation. When we use our creative ways to bless others, we are doing it for the right reasons. Ohhhhhh, his there Dajena. Thank you so much for your words of encouragement. You are so sweet. Please forgive me for the delay in responding. I know you can understand the time restraints on a mother with young children. Usually I wake up Saturday not wanting to do anything. Hahaha. We run around all week, that when Saturday arrives, it’s sacred. Hahaha. Much love to you, my dear friend, and please have an amazing week. I completely understand and you never have to apologize my friend. Please enjoy the love and giggles! Ohhhh, haha. I will thanks. And you too. That’s great Mihrank. Thanks for sharing that quote. Heyyyyy, thanks so much Advaita. So glad you liked it. How are ya? Hope you’re having a nice weekend. I had a nice weekend, thanks Advaita. Brazil is cooling off a bit. Brrrrr. Hahaha. Please have a wonderful week, my friend. Great piece 🙂 I do believe each one of us are designed to create. It can be from creating a drawing, quilt, or meal to creating a sculpture, gown, or skyscraper. I also think that people are happy when they are genuinely creating something. When the chance to create is taken away from someone, they can quite miserable. Thank you so much Crystal. Oh yes, creating isn’t limited to the visual or performing arts, is it. It can be found even in accounting. Haha. Yuck! I’m not a numbers person. –I know I sure am. Even if it’s not perfect. Glad to hear that you’ve been creating that loving environment. It’s so needed. I’m sorry you’ve had to go through this pain and loss Lorrie, and I hope it just serves to strengthen you. Thank you, my friend, and you also have a lovely week. Hiiiiiiii Neha. How are you? Thank you so much. I also love to create. Great minds think alike, right. Yep. I love to create. I love to create a good, good feeling of love in the world. I love to create a link to God. I love to express the love that God has for me into the world. Yep. I love to create. A pleasure to meet you Staci! Although the animals God created are amazing and beautiful, only humans have the gift of creating. I believe that He gave us that gift (not only because we are His children) but because of the joy He has in His creation, so that we can know the joy of creating. It is truly a gift from God. I concur, we were made to create. We were also made to move and that is where I find creativity and the joy of creating movement. I teach dance for fun and fitness; I’m a fitness instructor. However, my passion is worship dance, where I can express the joy of the Lord and dance before Him with all my might (as David did). Glad to find you (through Tammi). I’m following you and look forward to reading more on your blog! Keep on creating, you do it well! Hi Carmen, please forgive me for taking so long to respond to your wonderful comment and introduction. It is because you comment did not show up in my notification. Every so often I go into my WP Admin to see if there are, by any chance, comments in my ‘Pending’ or ‘Spam’ and this morning I did that. Your comment was there. It is so nice to meet you Carmen, and I love that you teach dance and fitness. I used to dance myself, as well as teach fitness. I am certified in fitness and nutrition actually. At them moment I am raising a 9 year old with Asperger’s Syndrome, who I have to homeschool (thanks to the school system here in Brazil), and a 6 year. I am also investing a bit in the visual arts now. More so drawing/painting and photography. Carmen, it really is so nice to meet you. I will be by again to see your blog and follow you. Wow! That last stanza blew me away! Since I was a child I loved to create. I enjoyed that bit of information from Elizabeth Gilbert––very interesting. I wouldn’t mind having a ‘Genius’ in my wall right about now. 😉 Ha, ha! Again, wonderful poem and illustration. I enjoyed that Ted Talk for Elizabeth Gilbert. Actually, I think it’s one of the most watched Ted Talks of all time. Her and Ken Robinson on education. Haha, wouldn’t that be great if we did have those genies. Thank you so much for your kind words and encouragement Vashti. Truly appreciate it. Staci, ur art play usually reminds me of that innocence on a child’s face..period. Nothing more can I say now. Thanks for that Greek-Roman remnant I wasn’t aware of that. I absolutely agree we were born to create or either fall in some others creation. Heyyyyy, my good friend, Saaransh. Thank you so much for your ever so generous comment. I’m always so happy to see you here. I swear, one day if I do make it back to India, we have to meet. Yea, I really liked that Ted talk by Elizabeth Gilbert. It’s one of the most watched Ted Talks ever. Oh yes, and the creation doesn’t necessarily have to be visual or performing arts. It can be the creation of a home, of a recipe, even creating with numbers. UCK! Not me. Haha. Not sure about he solitude thing though. I’ve created in solitude, and I’ve had artistic inspiration come whilst in a crowded area. Yea surely whenever u plan to visit India …it wud b a pleasure 😀 ….m gonna watch this Ted talk by Elizabeth Gilbert now. Saaransh, for some reason I didn’t receive this comment in my notifications. Ugh. Gotta love WP sometimes. You’re such a lovely person Saaransh. I’m always so blessed by your sweet and kind words/comments. I love this. This is so beautifully crafted. It was such a happy read. Thank you for sharing this. Thank you so much. I’m so pleased you enjoyed this. I’ll be by soon to check out your blog. Thank you so much. I’m so glad you enjoyed this. This piece is actually all done with oil paint. I normally use more than one medium, but I have been taking an oil painting class, so I stuck with the oil. I just digitally put in the poem afterwards. Thanks again, and I will be over to your blog soon to see. Thank you so much Sagarika. I’m so pleased you liked it. I agree that when we create, it certainly does nurture and caress our souls. Absolutely love creating! And definitely think we are all made to create. Love Liz Gilbert too! Thank you so much for sharing Juni. Me too. Oh yes. Liz Gilbert gave an excellent red talk. Thank you so much Skydreamer. I’m so glad you like it. I will be by soon to check out your blog. Looking forward to it.